Declining regional newspaper sales, down from an average of 13.5 per cent in 2014, may make you think twice about taking out advertising in your local newspaper. But are they really a lost cause? Here I look at the options and offer a few tips for success. Browsing through my local weekly paper, The Farnham Herald, there are plenty of advertising spots and a reasonable cross-section of B2C companies and organisations advertising. As well as the property section, there are ads from local public schools, home and garden retailers, event companies, and a Valentine’s Day advertorial with spots taken by wedding fairs, venues, restaurants and hair studios. So, presumably advertising is working for these businesses and I think we can tell why. 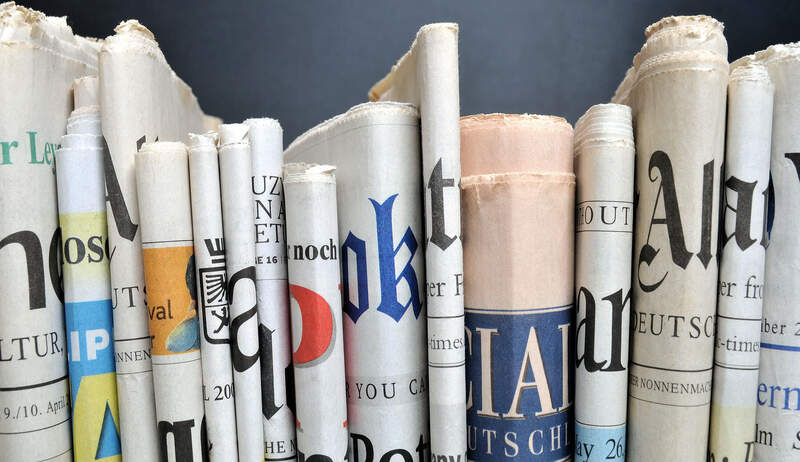 As with any marketing, success depends on getting your message out to the right people; the customers who buy the newspaper – provided they are the same as your target audience. In the case of the Farnham Herald, 23% of the residents in the town are over 60, and the average age is 45 years old. We know that statistically under 35s are less likely to read a printed newspaper*, instead, they get their news digitally. Therefore, I think it’s fair to surmise that Herald’s readership are predominately retired people or the over 30s; of whom these are mostly families and people moving into the area, and therefore looking for homes, schools and entertainment. Free Papers: If you are considering advertising in a free local paper you’ll need to take into account the demographic of the area it is distributed to, and also make some assumptions about who might actually pick it up and read it. An alternative to taking out an ad spot in a local newspaper is to use their distribution network to get your leaflet or flyer out to local residents. There are pros and cons to this. On one hand, if your target audience is the same as your chosen newspaper, it enables you to reach a specific audience. On the other is whether or not your target audience will take any notice of your leaflet. I think this can be especially true of using free letterbox newspapers to distribute leaflets. Whereas, a customer who has bought a local newspaper presumably intends to read it and therefore will see your flyer, a freebie coming through the door as a higher chance of going straight into the recycling bin: leaflet included. As with national newspapers, regional titles are fighting their declining print sales online through websites and social media. A good local example of this is the Get Surrey site. Part of the Trinity Mirror group, Get Surrey is the online version of the Surrey Advertiser and has over 15,000 Facebook “likes” and 35K + Twitter followers. Both social media channels are active with discussions and user interactions, as well as links to stories on the main website. According to Trinity Mirror Southern the user profile is 53% female, and 51% of users are between the ages of 15-44. So when we think about local newspapers, print is only part of the picture, advertising online is also an option and one that might be a better choice for those businesses wanting to target a younger local audience. Research: Ask the advertising team about distribution and user profiles to get a clear idea of whether the publication or online site is the right place for your business. Case studies are especially useful and, where possible, dig deep and get a firsthand opinion. If you see a comparable business advertising in your local paper, why not contact them and ask how successful it was for them? Target Your Ad: Having established that the newspaper targets the right people for your business, make sure your advert is targeted at them. Speak to your local customers, not to a generic national audience. This might involve referencing local landmarks, events or even something topical in the local news. Be Focused: What do you want to say? Concentrate on one message rather than listing every product or service your business provides. Consider what people might want at a particular given time, for example the Valentine’s Day promotions mentioned earlier. Include An Incentive: Special offers and promotions are a good way to advertise and encourage readers to buy from you within a short timeframe. Exclusive offers for readers are also a good tactic and will help you measure the success of your ad. Call To Action: Remember to tell readers what you want them to do next; “call now for a free quote…”, “book now and get your first appointment half price…”, “visit our showroom at…” etc. Don’t forget to include premise address and contact details; I’ve seen local ads with no details at all! Measure Your Success: If you want to know whether something is working you’ll need a method to measure results. Ask new customers where they heard about you, use exclusive offers / codes, or use a different phone number on your ads so you can see where inquiries are coming from. What’s your experience been of advertising in the local press? We’d be interested in hearing your stories, hello@hypedmarketing.co.uk.